Kim Kardashian and Kanye West were the best-dressed couple at this year's Met Gala! | HELLO! On Monday evening everyone who is anyone stepped out in New York City for the biggest night in the fashion calendar: the Met Gala. The theme this year was Manus x Machina: Fashion in an Age of Technology – resulting in a dazzling selection of metallic outfits on the red carpet. One couple who got it so, so right was Kim Kardashian and Kanye West, who were officially named the Best-Dressed Couple of the evening by Vogue magazine, which is a big deal considering US editor-in-chief Anna Wintour has been the event chairperson since 1995. Taking to Twitter after receiving the accolade, Kanye excitedly wrote: "I'm really excited to get our first best dressed at the met. This Gala is like the Grammys of style! "Thank you to Olivier [Rousteing, Balmain creative director] for making four dresses for Kim to choose from which we chopped 2 in half. And thank you for turning my personal jean jacket into a couture piece." Remembering to mention the entire glam squad, Kanye added: "Also to Kim's hair and make-up, Lorraine [Schwartz] jewellery and the whole style squad at Balmain and the Yeezy team. We just had fun with the 'future' theme!!! It was a fun night altogether…"
Kim, 35, stole the show in silver embellished Balmain, showing off her incredible figure in an armour-like corseted dress with a daring thigh-high split. But 38-year-old Kanye wasn't totally overshadowed by his beautiful wife. 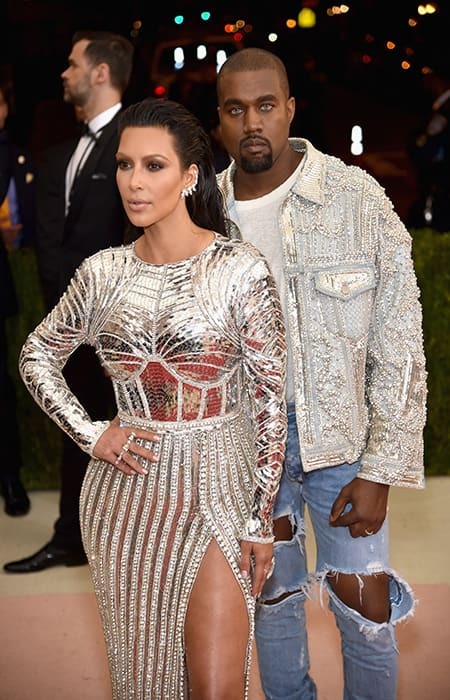 The rapper complimented Kim's look with an intricate silver jacket – also by Balmain – a simple white T-shirt and ripped Fear for God jeans. Really getting into the theme, the father-of-two also donned a pair of blue contact lenses, giving him a haunting look. What was your favourite look from the night? Check out the rest here and let us know in the comments box below.